Last year's operations produced over 5200 tonnes of uranium oxide at the Ranger mine, while owner Energy Resources of Australia (ERA) was pleased by an average price of over $50 per pound. The Northern Territory mine is the second biggest producer in the world and helps make Australia the world's third-biggest uranium exporter. Based almost entirely on long-term contracts, the average realised price of $50.84 per pound of uranium oxide represented a 56% increase over last year's trading. ERA said the figures were only partially influenced by current market prices "due to its diversified portfolio of contracts containing a range of pricing mechanisms." Nevertheless ERA's figures make clear that uranium producers are now benefiting from the significant increase in the uranium price since a dramatic price spike in 2007. Historic values of less than $20 per pound were swept away when prices raced to over $130 per pound, but the market has since been settling towards a stable lower level. According to Ux Consulting (UxC), the current price of uranium oxide for short-term delivery is $44.50 per pound. This spot price has fluctuated between $40 and $55 in recent months, while UxC's long term indicator has declined slowly over the last year to about $60 per pound. Ranger started operation in 1980 at production rates of 3300 tonnes of uranium oxide per year but in 1997 this was boosted to 5000 tonnes per year by an increase in mill capacity. Last year's production of 5240 tonnes was down 2% on 2008's figures. 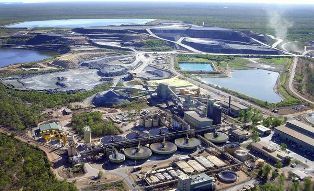 ERA expects to submit a draft environmental impact assessment in 2010 for a project to extract between 10,000 and 20,000 tonnes of uranium oxide contained in low-grade mineralisation in the current pit and on stockpiles.